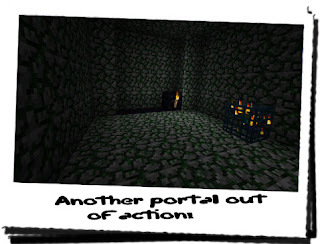 Diary of a Miner: Day 49: Portal #2 down... is that it...? Chiron woke me up this morning with his increbily loud and piercing bark! When I had shook off the daze I was in, and rubbed the sleep from my eyes, I went to investigate... Chiron was standing on the porch, leaning forward backing into the distance. It's not the first time he's done this; every time he's done it he's always been able to see something I couldn't. This time however, I had a feeling I knew what had got him worked up; in the distance were small, white figures running around just outside the gate. As I looked closer, I noticed that they were wolves... What was Chiron doing? Was he protecting the territory, or calling to them? I didn't really know, and I wasn't about to find out either; I had no interest in chasing wolves, and they weren't getting through the gate! Eventually I "persuaded" Chiron to get back into the house with some pork, and I secured the door. With pickaxe in hand, I headed towards the open-cast mine, thinking about what the day may bring. I was hoping I had got far enough through the wall yesterday to simply smash through today and find the portal. But I was jumping to conclusions; I didn't even know if there was a portal on the other side of the wall. Despite it going against everything I knew, it could just be an abnormally large amount of obsidian, where lava and water have met above me! The walk to the mine was reasonably quick; I had stopped taking my bow and quiver with me due to the considerable lack of threats recently, but today I had it slung over my shoulder, ready for anything! I don't know why, but when I woke up, I felt less safe than I had for the past few days! Come to think of it, it might have had something to do with the method Chiron had used to wake me up... Or the presence of wolves close to my quadrant. I got to the half-way point and began to long journey all the way down the spiral staircase that hugged the edge of the mine. Eventually, the sky above was blocked out by the stone ceiling, and the corridor became a tunnel, with less light, and noticeably less heat! Eventually I arrived back at the obsidian wall; the light cast from the torches seemed to be drawn towards the strangely smooth, dark purple stone, and then never bed reflected... It was eerie, and the sooner I found the portal the better! I placed the bow and quiver on the ground nearby and picked up from where I left off... No pun intended... After an hour or so, I noticed the familiar phenomenon that had occurred back in the dig site; the pitch of the pickaxe when it struck the obsidian had begun to decrease, until I had reached the low thunk noise I was expecting! A few moments later, when the pitch was as low as before, I broke through the obsidian wall, causing light to spill from the small hole! The chamber I had found, it was already lit! I spent a few minutes more increasing the size of the hole, to the size which made it possible to pass through it. There it was; standing at the far end of the room, partially buried into the ground was the portal, torches adorning the edges! 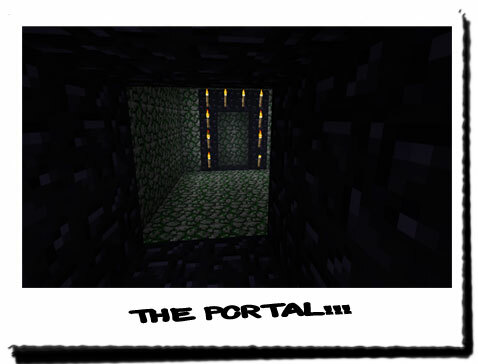 This portal was also inactive, but this time there was no secret entrance behind it, merely the mossy cobblestone wall that framed the entirety of the room! I knew I didn't have any TNT to blow the portal up with, but it was made from obsidian... Maybe I could just hack at it with the pickaxe like I had done with the obsidian tunnel...? It was worth a try... I entered the room and was about to move over to the portal when I noticed something in the corner of my eye. Stopping, I went to take my bow from my shoulder... I cursed, remembering I had left it back in the obsidian tunnel, and took my pickaxe in my right hand. I slowly turned around, raising the pickaxe... and then stopped... It wasn't what I expected... I couldn't have been able to predict what I saw at all... Another cage with a disfigured child trapped inside! I lowered the pickaxe and stared into the cage, at the small figure inside; on closer inspection, I realised it wasn't a child at all, but a smaller version of a zombie! It had the exact smae features as the one that had come at me in the tent; it lacked a lower jaw, and the tongue flopped down crudely against the neck. It had blood-stained face, hands and clothes, and had an odd green complexion, suggesting partial decomposition! It had it's eyes closed, and was not animated in any way. I had found this type of thing a few times before, one very similar to this, another containing a madly spinning skeleton on fire! I stood up and tried to ignore it, setting my mind on more important matters! 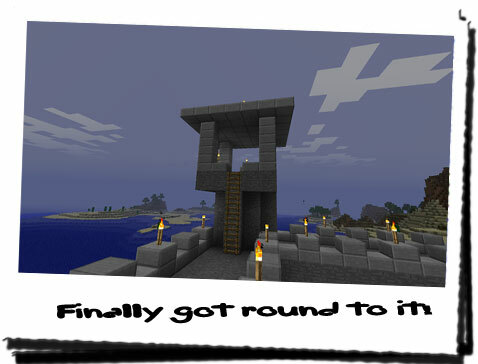 I turned to the portal and advanced, hoping that the hacking method with the pickaxe was sufficient! I began to attack it with the pickaxe, to be welcomed by small splinters of obsidian! It wasn't much, but it was enough to tell me I could destroy it with this method! I continued on hacking until te splinters became shards, and the shards became chunks and then small pieces, until I was digging out pieces about the size of my fist! It was slow progress, and within about an hour and a half, I had destroyed the majority of the portal! I removed the torches from the ground, as I was able to make use of them, and stood back, admiring the destruction! No-one was coming through that! 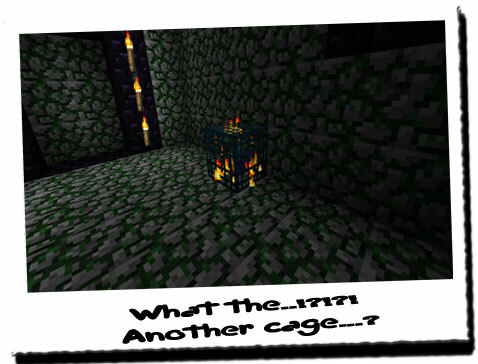 As I turned to leave the chamber, I heard a strange rasping shriek and then a puff of smoke erupted from the cage! I backed off, bearing my pickaxe in self-defence, but after the smoke cleared, I noticed that nothing was there! I was on edge; I had thought that the portal was still in action, and that the figure had chosen this moment to come back into this world! 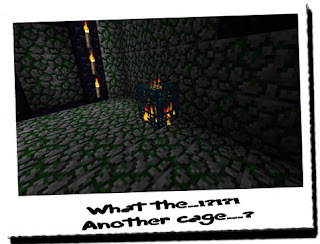 The room however was the same; the portal was still in ruins, the walls were still in place, the cage... the cage was empty! A moment ago, a small zombie had sat inside, but now it was empty, with no trace of its existance! Officially creeped out, I backed out of the chamber, into the tunnel and picked up the bow and quiver. I replaced my pickaxe with the bow and turned and ran out of the mine! I didn't stop running until the stone ceiling stopped and I met the bright blue open sky! I stopped, hunched over, wheezing... I was really out of shape! Catching my breath, I stood up straight and began the walk back up the staircase to the half-way point! I didn't know what I was going to do with the rest of my day, but staying in the mine wasn't one of them! After returning to the house, and wondering around looking for something to do, a visit to a storage chest full of stone gave me an idea! It was actually an idea from quite some time ago, and due to unforeseen events, I had become more and more distracted, and the idea had been pushed to the back of the priority queue! Taking out the stone however, I decided that now was a better time than ever, and I took the stone to the wall! I was going to extend the towers, and put a roof onto them for better security from the elements and outside invaders! I decided to start with the South-Western tower first, as it was the closest to the house, and begun the work. I had to refine the stone first, to make sure it was in keeping with the appearance of the wall... I am picky like that! After a few minutes of wondering how I was going to structure it, I set to work on a particular design! After a few hours, I had finished the tower, and was very impressed with the effect! I was going to start on the South-Eastern tower, but it began to rain, so I left the stone on the wall, ready for tomorrow and returned to the house. Chiron greeted me as I came in through the front door. I dumped my stuff off in one of the rooms, took out a loaf of bread and went upstairs. I still hadn't read through all the books I had taken from the campsite, and one book in particular seemed to catch my interest; "Wildlife Revealed: A Look at Minecraftia's Lesser Creatures"... I think that'll keep me interested for the night. I might even learn a few things!